So I decided to make my own wedding cake. This will be my first major cake. I would like to have your Italian Buttercream icing flavored with chocolate. I have read many of the other question's that have been posted but have found nothing that helps me. I have found that I really don't know much about this type of baking. You have a great site that is very helpful and I was wondering if I could just add chocolate syrup, cocoa, or bakers chocolate to the butter cream? I'm not sure what type of chocolate I need or how to add it in so that it wont mess the cake up. Congratulations on making your own wedding cake. In case you didn't know about my ebook here is a link to Wedding Cakes With Lorelie Step-by-Step. You can add cocoa powder if you like, or melted chocolate. I like Ghirardelli but you can use other brands. use a bittersweet or semi sweet. 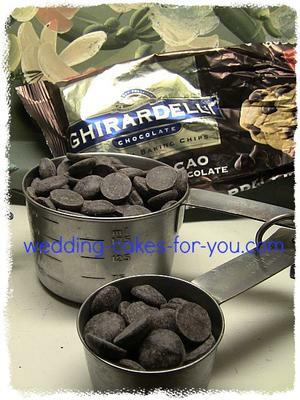 Place the chocolate pieces into a metal bowl over a pot of hot water. You can also heat it in the microwave being very careful not to over do it. Stir until it is melted. Let it cool a little bit and then add it to the buttercream. If you use cocoa then add it a little at a time and mix after each addition until you are happy with the flavor and the color. I would not recommend using chocolate syrup. Hope this helps. I would love to see your wedding cake when it is finished. How exciting. Please upload a picture or two to the DIY wedding cake invitation and tell us about it.